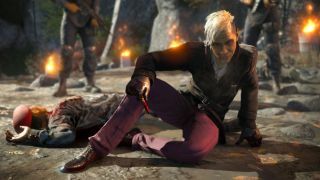 Ubisoft showed some new footage of Far Cry 4 at Gamescom 2014, highlighting the world of Kyrat that players will explore. The new trailer looks at three distinctly different areas from the game, from jungle wildlands to snowy mountaintops and a spiritual retreat. There isn't a lot of gameplay on display in the new video , but we know from past experience that Far Cry 4 will task you with shooting and blowing up lots of things. What's impressive here is the detail in the environments new to the game—one specific moment in the trailer highlights how you'll use your wingsuit to fly between cliffs on the mountaintop. There's also a cute animal moment near the end of the Kyrat segment, something every first-person shooter needs. Far Cry 4 is out on November 18.